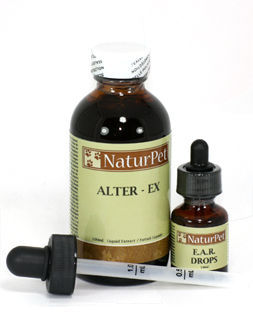 Why choose Liquid Herbal Medicine for your family pet? The goal of all natural medicine is the restoration of balance and equilibrium of the body to maintain good health. Herbal medicine, or phytotherapy, is one of the oldest systems of natural medicine used. Nothing is more natural than harnessing the healing powers of the plants, flowers and roots around us. Animals, in the wild, have an uncanny ability to seek out and eat plants that will help them when they are ill or injured. Natural herbal products work with their bodies to restore its natural function by correcting poor health, and maintaining good health. Herbal products are formulated to release the necessary active ingredients from the herb, or blend of herbs, that are appropriate for the intended use. It is the absorption of these key active ingredients that determine their effectiveness. Liquid-based herbal products provide the most rapid absorption and therefore the most efficient results. For products taken orally, liquid-based herbal products begin to be absorbed upon entering the mouth. While in the mouth liquid herbal products also stimulate digestive enzymes for increased efficiency of absorption, as they continue through the digestive system. This is of significance since the digestive system is often compromised in times of ill health. Liquid products are easy to administer. They can be mixed with warm water, mixed with food or dropped directly into your pet’s mouth. Your pets can now enjoy the benefits of herbal care, as natural as our love for them, with NaturPet. NaturPet is well on its way to achieving its vision of being a leader in providing superior, science-based and traditional herbal medicine for your pets.